The 7th grade students received the kit model, sanded and assembled the kit with the help of Mr. Parish, then loaded it with their messages to foreign middle school students. Mr. Parish was able to convince two other local Easternshore schools, Radcliffe Creek and Kent School, both in Chestertown, MD, to build models and the race across the Atlantic was ON! The models were launched just east of the north wall of the Gulf Stream on June 14 from the MV Bermuda Islander while in-route from Salem, NJ to Bermuda. The launch timing was intended to offer the teachers at the Country School three months of data over the summer to view, create, incorporate the model tracking into the school curriculum for the upcoming school year. Besides ocean currents and weather effects on the models, there is always the hope of landfall, offering new connections with foreign students. 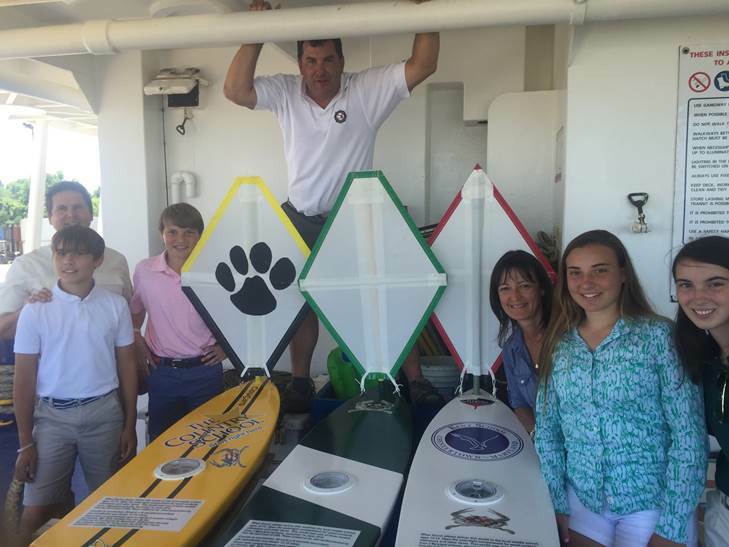 On the morning of Sept 7th, 2017, after traveling the entire North Atlantic and back, the little Cougars found herself sailing through what might be the biggest storm ever observed in this ocean, Hurricane Irma. She reported her position just off the Turks and Caicos Islands that morning and, about a week later, we saw her reporting from a remote location on the very small Salt Cay. Given the people of this little island are likely busy with recovering from the destructive storm, we delayed recruiting anyone to recover her. We thought we might not hear more and, in any case, her story would just go down as the little boat that came ashore with Irma. However, a few months later in early November 2017, with a little investigative work by Andrew Parish, the primary sponsor, he determined who found the boat and brought it into the village. With lots of help from John Galleymore of the local tourist board, we learned that a local fireman had possession of the miniboat. Turquoise Morning, the local news source for Salt Cay in the Turks and Caicos, shares the story of the finding and recovery of the miniboat Cougars. Having washed up during Irma, this little boat provided some excitement during a hard time for the islands. Thanks to fireman Ranfurly Been, who recovered the boat after seeing it “stickin’ up in the sand” – he described the finding in the video below. Click here to watch video of Ranfurly Been (finder of Cougars) explain his story. Click here to watch local interview. 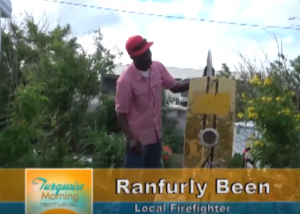 Click here to watch a video with a note from the District Commissioner of Salt Cay. “You never know what a small little thing can amount to something so great,” said Almaida Wilson, District Commissioner of Salt Cay in the video above. The 10 students on the island will be making repairs and relaunching the miniboat, so stay tuned! The Cougars miniboat has been brought back to Maryland and will soon see The Country School again! TCS Cougars (TCS meaning The Country School) is from The Country School in Easton, Maryland. TCS is a K-8 private day school, servicing the mid shore area of MD’s Eastern shore. 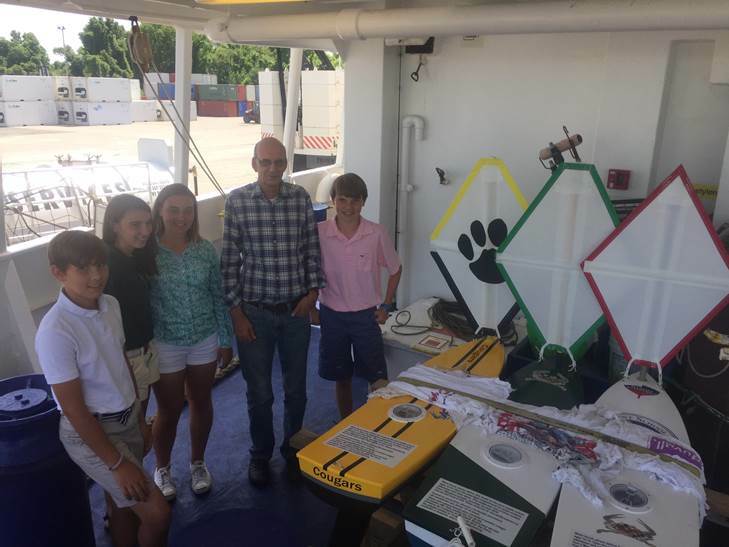 The program was headed by Andrew Parish, a Delaware River Pilot, inspired after previously launching four successful models for other schools.